Microsoft has just announced that they will soon be selling their own Windows 8 tablet, the Microsoft Surface, in both ARM and x86 versions. In certain ways, this is a truly innovative product, but the biggest question few seem to be asking is "How will OEMs handle this?". Let me start out by saying that I have made my thoughts on Windows 8 fairly clear already, and this doesn't really do much to change my mind because at the end of the day a device is only as good as the platform that it is based on. But since we've already covered that, let's take a look at the hardware & pricing aspects of this device and how it could affect other OEMs. The Microsoft surface brings a very interesting form factor to the table. 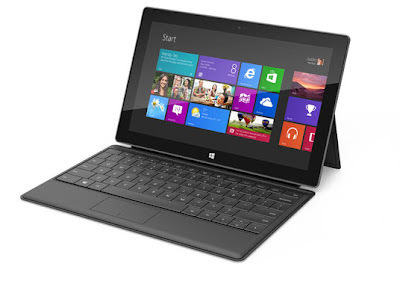 In essence, both the x86 and ARM versions are Hybrid tablets with the addition of the keyboard smart cover. I could see some OEMs attempting to replicate this kind of a smart cover, but it does have certain practical problems. For example, the smart cover keyboard & kickstand are most useful when placed on a "surface", but tablets are meant to be mobile devices. So as a mobile device, the Microsoft Surface may be looked as just another Windows 8 tablet as opposed to a hybrid tablet. But for users who primarily use their tablet as a more stationary device, the Microsoft Surface's form factor may hold just as much appeal as another hybrid tablet, if not more. The x86 version is said to be priced around the same level as ultrabooks, and most estimates range around $1000, while the ARM (Windows RT) version is said to be priced "competitively" with other tablets on the market. Considering the fact that Microsoft is charging OEMs $80-$95 for a Windows RT license, it is extremely unlikely for most ARM tablets to be priced below $400-$500. My guess is most WinRT tablets will be priced at the same level as the iPad (or higher) and so will the Microsoft Surface. Any move by Microsoft to undercut other WinRT tablets on pricing would result in an open revolt from OEMs. Based on this pricing structure, the x86 version of the Microsoft Surface seems to have a very limited target market - occasional high-end enterprise users, executives and the odd power user/enthusiast (same as ultrabooks). Microsoft seems to realize this, since this version is set to launch 3 months after the ARM version. Meanwhile, the Windows RT version, focused on the consumer market, doesn't really offer much value as it costs as much as an iPad or other Android hybrid tablets, without a large library of apps. Since Microsoft Office is set to be released for both the iPad and Android tablets at around the same time as the Microsoft Surface hits the market, productivity isn't really much of a factor either. When Google acquired Motorola, it faced a huge backlash from OEMs that feared Google entering the hardware business, in direct competition with them. Even though Google announced that Android was to remain open source and that Motorola would be operated as an independent entity, it was only able to calm these fears by expanding its OEM partnerships through the Nexus program. With the Surface, Microsoft has already entered into direct competition with its OEM partners. This is a far more serious threat to OEM partners than Google's acquisition of Motorola, especially considering the fact that OEMs have to pay Microsoft a substantial license fee for every Windows 8 or Windows RT device. The largest OEMs, such as HP & Dell, will certainly be the most vocal as they are banking on Windows 8 based products to save their consumer business. Microsoft owes its success to long-standing OEM partnerships and by entering the hardware business it has put those very relationships at risk. Conclusion - Microsoft may be onto a truly innovative product with the Microsoft Surface, at least in terms of hardware. But managing pricing issues and OEM relationships will be of prime concern going forward. I disagree with your statement that the x86 Surface has a limited target market. People have the option to do away their home desktop or laptop, which most people still need to do the productive work their tablet can't. This combining of two devices into one is attractive for saving dollars and space at home. One device also means bringing the productivity of a home or office PC out on the road, but in a mobile form factor which folds back into a tablet when only a tablet is required. 5. On the daily commute home I can use it as a tablet to consume content. Jonathan, I completely understand your point. The thing is the same could be said of Ultrabooks as well. Content consumption would be slightly more limited, but it fits most other requirements. The reason it hasn't happened is because of the pricing. Tablets today aren't killing off PC use, they're killing off PC sales. Replacement cycles, especially on the consumer end are getting stretched indefinitely because of the availability of cheaper tablets. Will the x86 Surface find willing buyers? Absolutely. Will it find more willing buyers than Ultrabooks have? I don't see much of a rationale for that. This is going to be an even bigger problem than we see it today because of what's going to happen on the pricing end in the tablet market over the next two quarters. The x86 version will definitely find buyers among high-end enterprise users. But that isn't a very large market compared to the consumer market. In addition, the x86 version will be priced twice as high as an iPad, so for middle management types, CIOs will still push the iPad. With MS Office for iPad/Android, there is no benefit of getting a more expensive ARM tablet either.